It's a brighter Saturday, although the clouds seem to be looming in. Mum is also brighter today, she has been very slow and lethargic since coming out of hospital but she seemed much happier and was organising herself when I went to see her earlier. I hope the progress continues. This week's theme at Theme Thursday Challenge is 'Your Favourite Letter' and of course this caught my eye immediately and I chose the letter B, what else could I choose??? I had great fun creating it and a saying I found helped me to have more confidence in putting it together quickly, rather than spending hours 'thinking' and changing my mind. As you know I cannot see the end product in my head and although I have an idea of where I am going, I always end up stopping along the way and going back over bits and changing them. But I guess that is the process of creation for me and the way my brain puts things together. I had a card with a pre-printed border down one side and used Dusky Concord DI round the edges to pull it together. 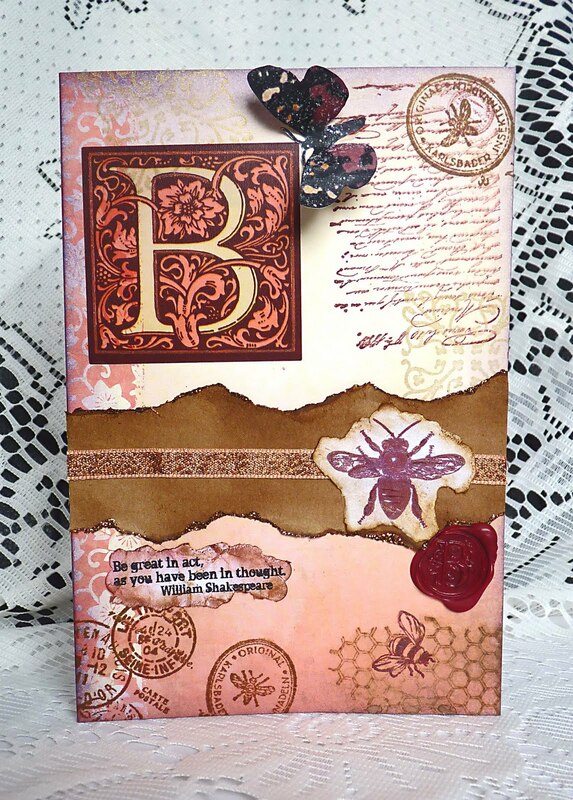 I have several bee stamps and used two of them here, I also stamped the honeycomb, the postmark, the handwriting and the square heritage design. I added a bee and butterfly, both printed from the computer. Across the centre I stuck torn, brown paper with ink distressed edges and some ribbon and added the ornate letter B in the top left, taken from my stash. I also printed the sentiment by William Shakespeare which starts with the letter B and ink distressed it to fit in with the rest of the card. I added a wax seal with my initial, of course the letter B. Hey presto, completed in less than a day and I really quite like the finished effects. the whole thing. Thanks so much for sharing with us this week at For Fun Challenges. Gorgeous card - love all the stamped detail. Thanks for taking on my challenge at Allsorts this week and for joining us at Papertake Weekly. beautiful! thanks for playing along at SSDS! Really great card! !Love the vintage look. Thank you for joining us at SSDS this week. Wonderful card! I love the colors and the bugs make me think of summer.LOL Thanks for playing along at SSDS. Good Luck! A beautiful card Brenda. Thanks for bugging us with your fantastic entry. Another lovely card, love the stamping and distressing. Like the way you have made this card your own,not forgeting the B for Brenda. Well done. Fantastic card all that wonderful texture and detail its wonderful. Did you see we have a sponsor again this week, a little link to Craft Barn and your in the draw for their prize this week. Thank you for buggin' us at TT this week. Love bumble bees, butterflies and honeycomb so you got my vote! Your card is absolutely stunning! I love all of the distressing. Thanks for playing with us this week at SSDS. I never know what I'll create till its finished,I always find its better to go with the flow.....love your card,beautifully stamped and a fab layout to it. B is for Bugs and B is for beautiful too! great card! Thanks for sharing with us at TT this week! Great card! Love the vintage look! Thanks for playing at SSDS! Hi Brenda, wow there's so much creativity in your card i have been looking at for the last few minutes. Beautifully put together and the perfect coordinating colour combo. Wonderful card Brenda, beautiful images and fab details. Beautiful card and thanks for joining TT this week. Your card has a very artistic feel to it! Love the not-too-crowded collage look. Love all the details there are to check out yet it all comes together wonderfully! what a fabulous vintage card Brenda!!! Thank you for sharing it @ Creative Card Crew!! !